Hi, I’m trying to implement your code to my existing project. I did it by copying MainActivity.java and activity_main.xml to my project. However, I am not sure on how to edit my AndroidManifest fail. I copied the code but can’t seem to get it work. I’m new in developing android app. Hope you can give me some guidance. Thank you. If I want to copy the file to a directory which does not exist. How should I modify the code so that a new directory is created and the file is copy to it? Hi Mike, is there a way that this can be implemented on Ionic app? thanks. thank you so much for the reply. will explore on this and get back to you. cheers. How should I handle the devices without sdcard?is there any way to determine the existance of a sdcard?or can I copy the files from assets folder to a somewhere else like internal device storage or android root or android data directory? How I should modify the code if I want to copy the files to internal storage instead? The code below will only copy the database files. 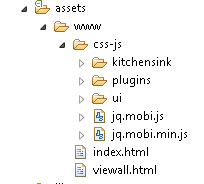 How if I want to copy all the files in a subfolder in asset? Hello I got two question here want to ask. First can i know how to modify the coding on how copy pdf files from assets folder to SD card and then opens in pdf veiwer apps ? Is it ok i use android storing blob in sqlite and retrieving it or using content provider ? Hi, Can i know how to copy pdf files from assets folder to SD card and then opens in pdf viewer apps ? Is it ok i use android storing blob in sqlite and retrieving it or content provider? Thanks for reading our post @disqus_9XxW36qQIu:disqus!